Multi-Service Eating Disorder Association (MEDA): This non-profit organization is dedicated to the prevention and treatment of eating disorders and disordered eating. MEDA’s mission is to prevent the continuing spread of eating disorders through awareness and early detection. MEDA serves as a support network and resource for clients, loved ones, clinicians, educators and the general public. Project HEAL: Project HEAL is a non-profit organization that fundraises to provide grants to individuals who cannot otherwise afford eating disorder treatment. Founded by Kristina Saffran and Liana Rosenman in 2008, who first met as teenagers in treatment for anorexia nervosa, Project HEAL also works to raise awareness for eating disorders and promote recovery. Eating Disorders Coalition: The mission of the EDC is to advance the federal recognition of eating disorders as a public health priority. 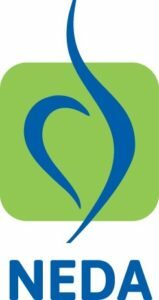 National Eating Disorder Association (NEDA): The National Eating Disorders Association (NEDA) is the largest non-profit organization in the United States working for the awareness and prevention of eating disorders. NEDA also provides treatment referrals, support networks, and resources for those struggling and their loved ones. Binge Eating Disorder Association (BEDA): It affects more than eight million men and women and accounts for three times the number of those diagnosed with anorexia and bulimia together. BEDA is committed to helping those who suffer from binge eating disorder conquer their disorder. So if you or someone you care about lives with binge eating disorder, BEDA can help. If you treat the disorder, BEDA can help. International Association of Eating Disorder Professionals: The International Association of Eating Disorders Professionals (iaedp) is well recognized for its excellence in providing first-quality education and high-level training standards to an international multidisciplinary group of various healthcare treatment providers and helping professions, who treat the full spectrum of eating disorder problems. FreedFoundation.org: The Gail R. Schoenbach F.R.E.E.D. Foundation is a non-profit organization dedicated to eradicating eating disorders. The funds contributed to the F.R.E.E.D. Foundation will provide individuals the financial support needed for the treatment of eating disorders. National Association of Anorexia Nervosa & Related Disorders (ANAD): The National Association of Anorexia Nervosa and Associated Disorders, Inc. is a non-profit corporation which seeks to alleviate the problems of eating disorders, especially anorexia nervosa and bulimia nervosa. The National Association for Males with Eating Disorders, Inc. (N.A.M.E.D.) is dedicated to supporting males with eating disorders and their families and being a resource of information on the subject. Visit http://www.NAMEDinc.org for a treatment referral, information, and support. Men Get Eating Disorders Too information that is specific to the needs of men including definitions and symptoms, treatments, links, support, etc. The site is a platform for which men with eating disorders can get their voices heard by telling their stories, writing blogs and participating in our online forum and live chat. Hardy Girls, Healthy Women HGHW is a nonprofit organization dedicated to the health and well being of girls and women. Our vision is that all girls and women experience equality, independence, and safety in their everyday lives. Rock Recovery is a DC-based nonprofit that supports the journey to freedom from disordered eating. We remove barriers of cost, stigma and isolation through a holistic outpatient recovery program for adults and community empowerment events. We uniquely combine clinical expertise rooted in research plus spirituality for deeper healing and restoration. Beat: Beat is the top eating disorder non-profit organization in the United Kingdom. Through regional and international projects, Beat works to raise awareness and reduce stigma surrounding eating disorders on a global level. Austrian Society on Eating Disorders (ASED): The Professional Austrian Eating Disorder Society is a scientific society located in Innsbruck encompassing the whole of Austria. It was founded in 2000 as a non profit organisation. The ASED is the first German scientific society on Eating Disorders. British Association for Counselling and Psychotherapy : Is leading the effort to make counselling and psychotherapy widely recognised as a profession whose purpose and activity is understood by the general public. The BACP mission is to be the leading professional body for counselling and psychotherapy and an automatic reference point for anyone seeking information on counselling and psychotherapy in the United Kingdom. Bulimia Anorexia Nervosa Association(BANA): Bulimia Anorexia Nervosa Association (BANA) is an outpatient clinic, located in Windsor Ontario, Canada, that offers specialized diagnostic assessment, support, treatment, and prevention/education,programmes to persons affected by eating disorders. BANA provides opportunities for research, and assists with referrals to specialized inpatient Eating Disorder programmes, around the world. BANA is an advocate for persons affected both directly and indirectly by eating disorders. The National Eating Disorder Information Centre (NEDIC) :The National Eating Disorder Information Centre (NEDIC) is a non-profit organization founded in 1985 to provide information and resources on eating disorders and food and weight preoccupation. One of our main goals is to inform the public about eating disorders and related issues. Medical News Today @ Eating Disorders: The latest Eating Disorders News articles published daily. Includes news on anorexia, binge eating, bulimia and much more. EAGALA The Equine Assisted Growth and Learning Association is dedicated to improving the mental health of individuals, families, and groups around the world by setting the standard of excellence in Equine Assisted Psychotherapy.